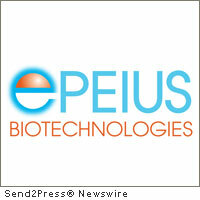 SAN MARINO, Calif., Feb. 28 (SEND2PRESS NEWSWIRE) — Epeius Biotechnologies (www.epeiusbiotech.com) announced today that the U.S. FDA has granted Phase 3 status for Company’s lead anti-cancer agent, Rexin-G, the first, and so far only, targeted gene delivery system developed to seek-out and destroy metastatic cancer. In addition to these high-priority programs, Rexin-G has demonstrated significant anti-tumor activity in chemotherapy-resistant breast cancer, hormone-refractory prostate cancer, ovarian cancer, squamous cell carcinoma, and certain hematologic malignancies, such as large B-cell lymphoma. Rexin-G® was granted accelerated approval for the treatment of all chemotherapy-resistant solid malignancies in the Republic of the Philippines in 2007. In the U.S.A., Rexin-G gained Orphan Drug Designation and market protections from the FDA for pancreatic cancer in 2003, followed by Orphan Drug Status for both osteosarcoma and soft tissue sarcoma in 2008. More recently, Epeius Biotechnologies completed a series of Phase 1 and Phase 2 clinical trials in the U.S., establishing the thresholds for bioactivity and dose-dependent efficacy for Rexin-G against a number of otherwise intractable cancers, as well as the product’s overall safety over extended survival times and a notable lack of either safety issues or dose-limiting toxicities. With these development-stage accomplishments at hand, Epeius is gearing up to open a series of pivotal studies for both pancreatic cancer and sarcomas in the U.S., while continuing to advance the clinical utility and market development of Rexin-G worldwide. With the completion of the enabling platform development and the clinical validation of its foremost oncology product, Epeius Biotechnologies continues to lead the field of genetic medicine with the development of its product pipeline, which includes Reximmune-C, a tumor-targeted gene delivery system for “personalized” cancer vaccinations, administered to stimulate a long-lasting anti-tumor immunity. For further information about Epeius Biotechnologies, its lead products, and its clinical trials, please contact Erlinda M. Gordon, M.D., at egordon@epeiusbiotech.com . Original Keywords: targeted gene delivery system, anti-cancer agent, Rexin-G, Orphan Drug Status for both osteosarcoma and soft tissue sarcoma, Erlinda M Gordon, chemotherapy-resistant breast cancer, Reximmune-C, pharma, cancer vaccinations, California tech news Epeius Biotechnologies Corporation San Marino California SAN MARINO, Calif.
REFERENCES: Business News, targeted gene delivery system, anti-cancer agent, Rexin-G, Orphan Drug Status for both osteosarcoma and soft tissue sarcoma, Erlinda M Gordon, chemotherapy-resistant breast cancer, Reximmune-C, pharma, cancer vaccinations, California tech news Epeius Biotechnologies Corporation San Marino California SAN MARINO, Calif.